SUNWAYLED L10A "Angle-Head" Review (1xAA): RUNTIMES, BEAMSHOTS and more! 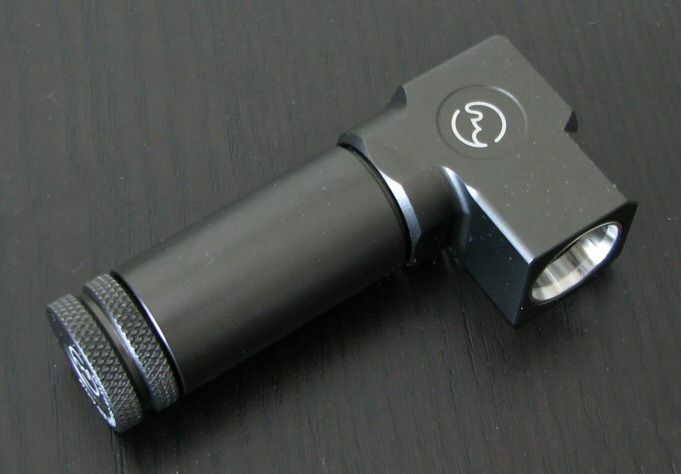 Thread: SUNWAYLED L10A "Angle-Head" Review (1xAA): RUNTIMES, BEAMSHOTS and more! Reviewer's Note: The L10A was provided for review by SUNWAYLED. 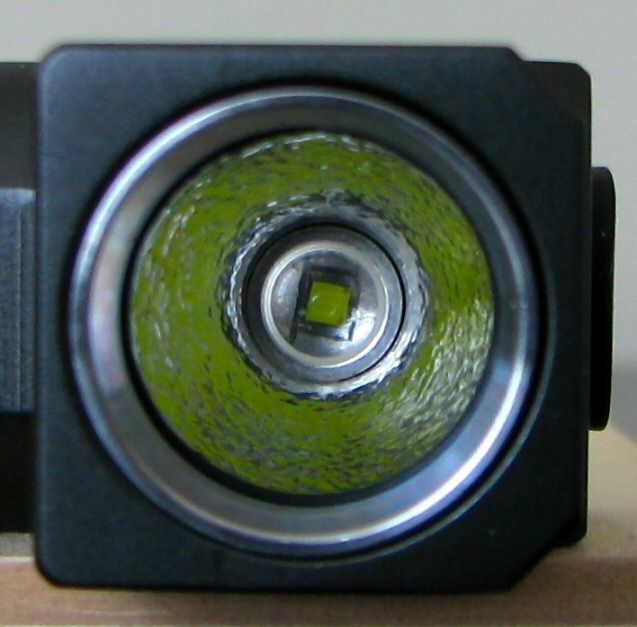 The L10A is an example of side-projecting flashlight from SUNWAYLED (i.e. 90 degree angle-light). The L10A uses 1xAA battery, although SUNWAYYLED also sells a 1xCR123A version (L10R). Note the voltage range above: 3.7V Li-ion sources (4.2V nominal) are NOT supported according to the current SUNWAYLED specs (i.e. 0.9~3.2V only). This has changed from my review sample, where the included manual quoted the range as 0.9~4.2V. As such, I have tested the light on 1x14500 in this review, but I caution that this battery source is no longer officially supported. The light comes in a fairly typical cardboard box with plastic insert. 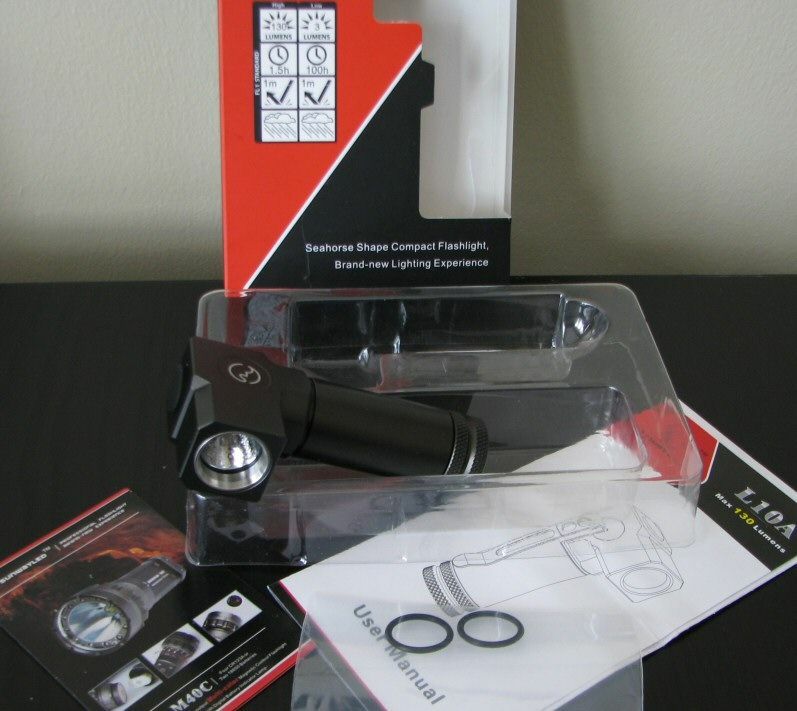 Included inside the package were the light with removable pocket clip, manual, warranty card, promotional insert, and extra o-rings. The most distinctive feature is the angle-head of this light. I haven’t tested too many of this style, outside of headlamps. In this case, I expect the light is intended to be used as something you would clip on a belt or a shirt pocket, for hands-free use illumination of the path in front of you. 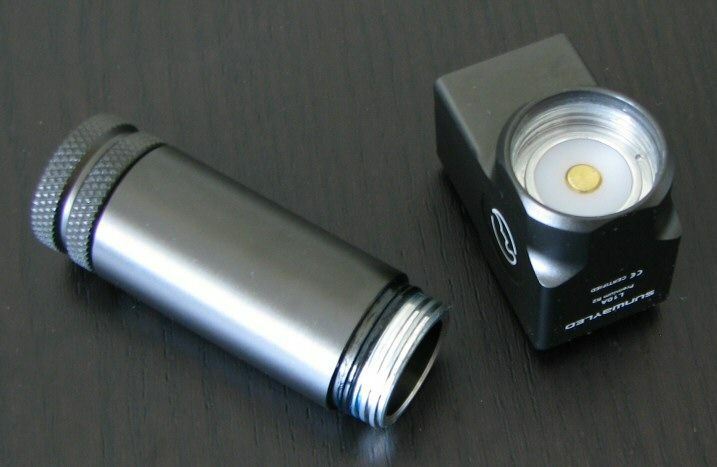 The light lacks any knurling on the body – only the tailcap. But the unusual shape helps with grip, as does the removable body clip. The clip on my sample is the same style noted in my M10R and M20C reviews, and it is not very firmly attached to the body (roughly similar to the M10R). However, I understand from SUNWAYLED that this has been replaced on currently shipping L10As to a new style with a closed ring that must be inserted between the head and the body. I would consider that an improvement, as this older style could lead to accidental detaching and dropping of the light. 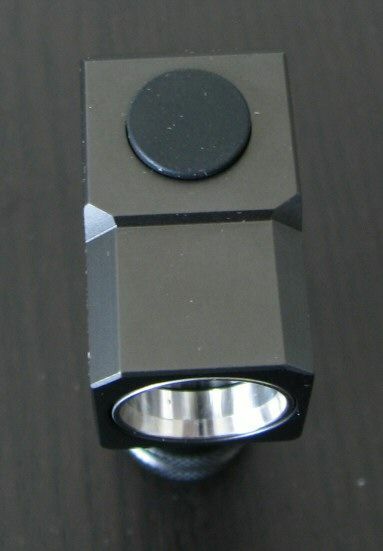 Like all SUNWAYLED lights I’ve reviewed, the anodizing is excellent on the L10A. No chips or flaws on my sample, and the color is a rich dark gunmetal grey. Also like the other lights I’ve reviewed, high quality machinist square-cut screw threads are used. 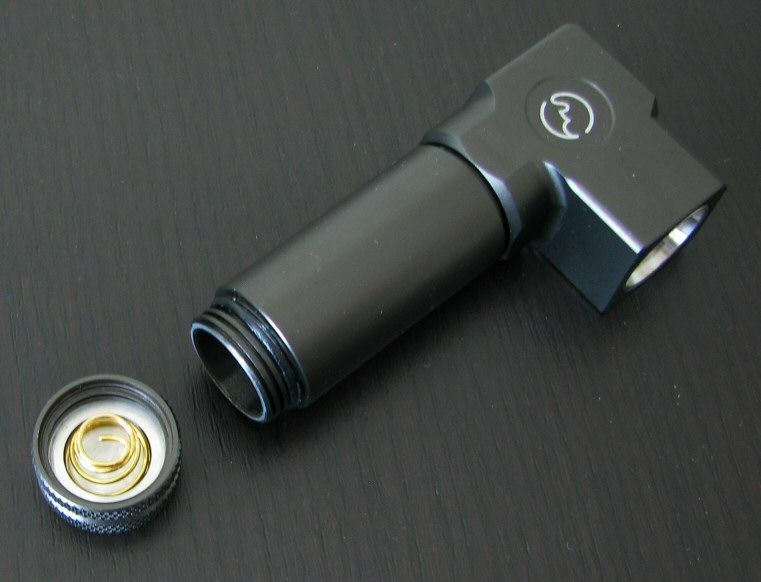 These are anodized, allowing for tailcap lock-out. The L10A can tailstand or headstand (although with a bit of wobble for headstanding, due to the switch). The light uses an electronic switch under a low-profile boot cover on the head. Feel is about typical for this kind of switch (i.e. think of the buttons on modern electronic devices, such as your DVD player, flat-screen monitor, etc). The light comes equipped with the older style XR-E emitter (R2 output bin) inside a reasonably deep reflector (orange peel). 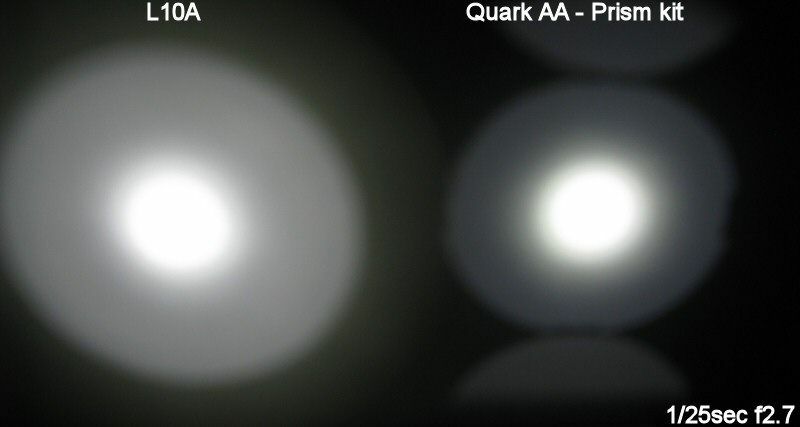 I’ve recently moved, and haven’t had a chance to set up a proper beamshot closet yet, but here’s a quick comparison to the L10A to 4Seven Quark AA with angle-head cover, both lights about ~1 meter from a white ceiling (on Hi). The beam pattern is actually surprisingly smooth for a XR-E, likely due to the heavily textured reflector. But this also reduces the centre-beam throw of the light. Scroll down for some throw and output numbers. On/off and mode switching is controlled entirely by the electronic switch in the head. As such, there needs to be a “standby” current at all times. Press and release the switch to activate the light on Hi. Press and release again to turn off. Light also has a momentary mode - just press and hold the switch from off (once you release the switch, the light will shut-off). While on, press and hold the switch to activate the tactical strobe mode. Strobe stops as soon as you let go of the switch (i.e. strobe is momentary only). 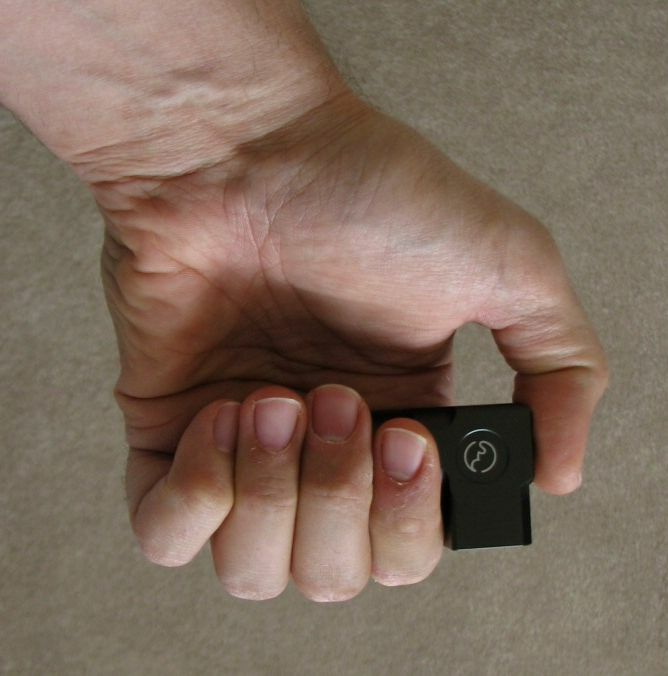 You can lock the strobe on by a quick click followed immediately by a press-hold. The strobe will then persist until you turn the light off or switch modes. From on, double-press the switch to change the constant output mode (i.e. press and release twice, with less than a second between each cycle). The next mode after Hi is Lo, followed by Med if you double-press again. The light cycles in this Hi – Lo – Med sequence indefinitely on repeated double-presses. There is no memory mode – the light always comes on in Hi. UPDATE 9/14/10: In response to a user's question, I am pleased to report that the controller can respond immediately to multiple presses, even from off. Thus, you can triple-click from Off for Lo, or "penta-click" for Med. However, you will briefly flash through the Hi mode mode first - but you could always block the output with your hand initially if you wanted to start on a lower setting. 1xEneloop NiMH: 52.6uA, which for a 2000mAh Eneloop, would translate into 4.3 years. Clearly, the standby current for my sample on 14500 is a concern – a fully charged cell would be completely drained within 3 weeks, even if never used. This may partially explain why this battery source is no longer officially supported. In any case, if you plan to use the unsupported 14500 battery source, I recommend you lock out the light at the tailcap when not in use. Unlike the other SUNWAYLED lights I’ve tested, I was able to detect a PWM signal on the L10A, but only at the lowest level, and at an unnoticeable frequency – 7.7 kHz. There is no sign of PWM on Med or Hi. Strobe was measured at a “tactical” (and nauseating ) 19.4 Hz. 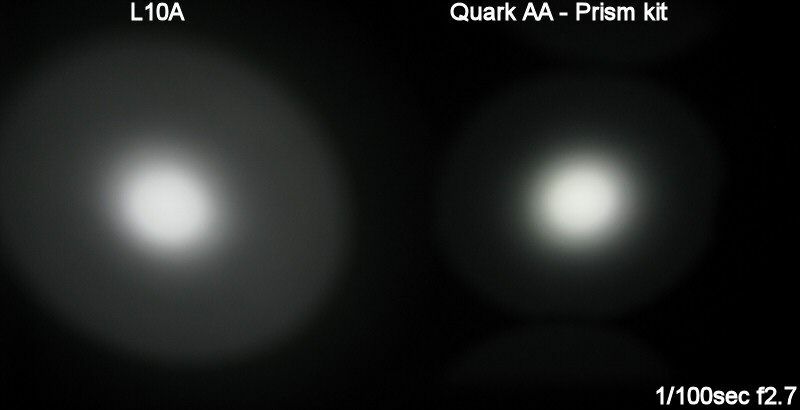 On standard batteries, the light is heavily driven on Hi, with the highest output I’ve seen for a R2-equipped light. Throw is toward the low end for this class however, likely due to the heavily textured reflector. On the unsupported 1x14500 battery source, output is considerably brighter on Hi, and is again at the top of the class for a R2-equipped light. Output/runtime performance on Med/Hi are very good – definitely at the top-end of a XR-E R2-equipped light. The light is clearly current-controlled at these levels. Note that the Med output level is closer to the Lo level of most lights, however. I haven’t done Lo mode runtimes, as the level is quite low (not quite “moonlight”, but close). 1x14500 Li-ion is not officially supported (i.e. 0.9~3.2V voltage range only). Although the light performed well on 14500 in my testing (i.e. relative output levels are maintained, with Hi mode being higher than standard batteries), the standby current on 14500 is sufficiently high to drain a fully charged cell in under 3 weeks. Relative lack of knurling on the body or switch cover, light could be slippery when wet. Light lacks a memory feature, and always comes on in Hi. Like the other SUNWAYLED lights I’ve reviewed recently, the L10A is generally a solid and well-built light. The angle-head design is different, making this something of niche product. I suspect it would find the greatest use as the body-equivalent of a headlamp (i.e. 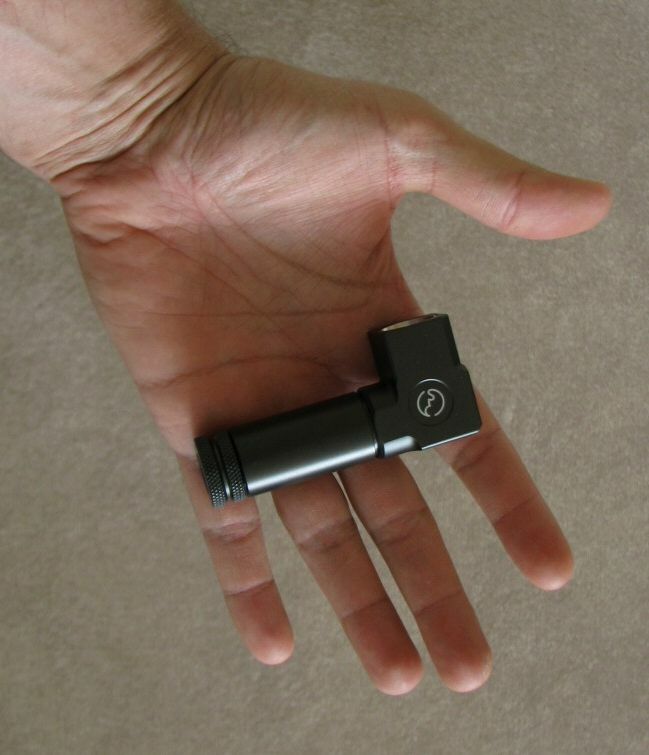 something you clip onto a pocket or belt to illuminate the way in front of you). Given that intended usage, I'm glad to hear they have moved to a more secure clip on currently shipping samples. The one on my early sample (shown here) is not very firmly attached. Although I haven’t tested this new clip with a closed ring (that must be inserted between the body and the head), I am sure that would work better. The light showed very good runtime performance on the Med/Hi output levels - definitely top-of-class for a XR-E R2-equipped light (i.e. clearly current-controlled). Note though that the Med level’s output is bit lower than typical (closer to most lights Lo), and the L10A’s Lo mode is closer to a “moonlight” level. The L10A’s Lo level also uses PWM, but at a high enough frequency not to be detectable by eye (7.7 kHz). The beam profile is good for this sort of light. While the throw is at the low end for the 1xAA class, this is not unreasonable for its intended purpose (i.e. you want to illuminate a reasonably wide area in front of you). My sample also has a surprisingly smooth beam, give the XR-E emitter used. It is a shame that 1x14500 is not officially supported on the light. This battery source actually worked quite well in my testing – but the high standby current means that you would need to keep the light locked-out at the tailcap when not in use. You are best sticking with standard AA batteries for regular use, where the standby current is low enough to give you several years shelf life. A distinctive little light, with good performance on regular AA batteries. Last edited by selfbuilt; 09-16-2010 at 08:32 AM. Re: SUNWAYLED L10A "Angle-Head" Review (1xAA): RUNTIMES, BEAMSHOTS and more! Excellent review, as usual. Sounds about like what I saw with the L10R, except that one had a better clip. Nice job! Ex ignorantia ad sapientiam e tenebris ad lucem! LaymansLights.com Now on Facebook and Twitter. What an awesome review - thanks for this report! I was already interested in this light, now i really want it. 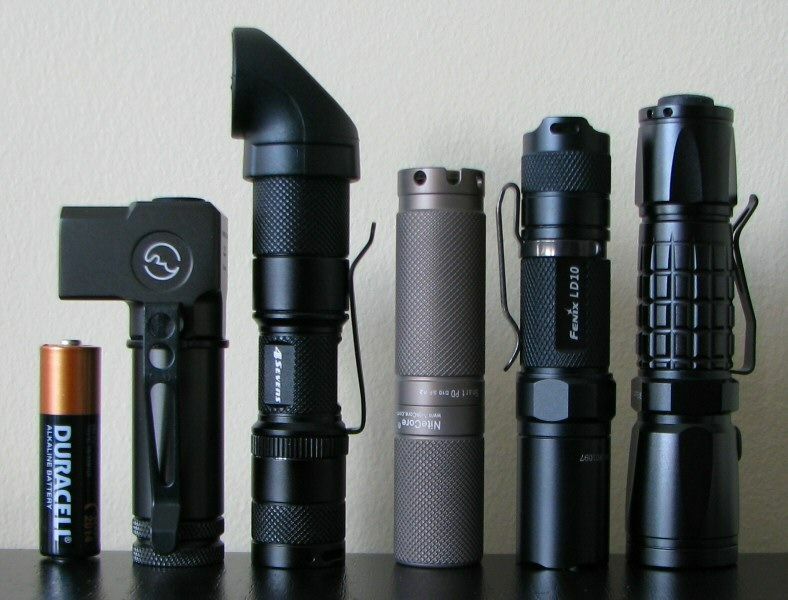 Having not used the light, I would rather prefer low-med-high or med-low-high for a non-outdoor edc if there is no mode memory. How would you personally rate the UI? Thanks, you too. And yes, that seems to be the new standard clip. Since you have one, how do you find it? Can it be reversed at the tailcap end, or does it only fit on the head (i.e. can you do bezel-down as well as -up carry)? Having not used the light, I would rather prefer low-med-high or med-low-high for a non-outdoor edc if there is no mode memory. How would you personally rate the UI? Well, I've never been a fan of Med-Lo-Hi personally, and prefer Lo-Med-Hi or Hi-Med-Lo. But I think a memory mode would have been a good idea here - that way everyone gets what they want. I do like the momentary-only strobe. That is certainly distinctive. But as always, I would personally prefer a slow-signalling strobe (i.e. 2 Hz, not 20). I don't see why someone would need a "tactical" 1xAA light. I will have to check about the bezel down carry. If memory serves, it should work just fine though. The only thing I might see is that the clip might be too long for the 1x123 body and actually rest on the sharp angles of the head. A note about the strobe. The momentary-only mode is very nice, but did you see that it also has a way to lock the strobe on? Just click and then press-hold and it will switch to strobe and lock there. The light also has a momentary only option for on. When the light is off, just press-hold and it will stay lit for only as long as you hold it. The UI is quite ingenious I think. Confirmed, mine works the same way. Just update the UI section of the review. My L10A does not work with the clip in the 'wrong' place, at the back of the battery compartment. I like it, just wish it had mode memory (and a neutral LED). My biggest light-hog is my camera. L10A is nice and seems to have a strong body. It's a shame that runtime performance on high mode is not good with a eneloop battery as compared to other lights. Does the clip seem sturdy to you? I wrote about the L10A here. The new clip is very sturdy, although I bent it with pliers so that it would grip narrower fabric. I think I would need another pliers session to break the clip, and can't think of a good way to do it by accident. 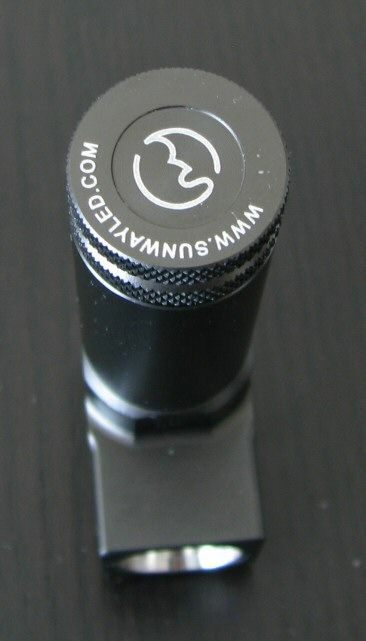 Ah, not surprising - I'm guessing it prevents tailcap contact (the screw threads are anodized). The one "merit" of the old clip then - it could fit reliably on either end. Actually, it's quite good for a XR-E R2, compared to others I've tested. But it does seem like the newer XP-E/XP-Gs have a runtime advantage. This is likely due to the typical Vfs for the various batches of emitters - it was likely higher for most of the XR-E R2s compared to the earlier XR-E Q5s or later XP-E/G R4/R5s. This puts the XR-E R2s at a runtime disadvantage with most circuit setups. You'll have to ask those who have the currently shipping clip. My old sample does not, but I'm informed they are no longer using it. The new one should be pretty sturdy, as it must be assembled between the head and body tube. How quickly can you cycle the modes into low or into med? Or in other words, with a fast finger on the button, can you virtually start in low or med mode by fast-clicking over the initial high (i.e. triple-click / penta-click startoff)? Or is the controller too slow for that and demands pauses between the input? That's a good question - just tried it, and the controller does respond immediately. So you can triple-click from Off for Lo, or penta-click for Med. But you will flash through the other modes first (i.e. triple-click will momentarily show you max before settling on Lo, etc). Still good to know - you could always block the output with your hand initially if you wanted to start on a lower setting. Thanks a lot - that is very good news !! I hope that Sunwayled / Sunwayman will provide some optional parts for the L-series. For example an additional battery tube would be helpful, so we could take CR123 primaries for the longer tour and AA NiMH in edc use without having to buy both lights (which would rarely be the case, h3h3...). Also, I wouldn't be surprised if they're gonna set up an 18650-based "L20" or something. Thanks for the review, I have been interested in this light but did not know much about it. Great info!!! Looks like a great light. The UI is quite similar to a novatac tactical. In fact almost exactly the same as I have my 85P. The mode setup sounds great also. After using the L10A for a week or so I've got to say this is a well made handy little light. The spring in the tail cap is long enough that an AAA cell can be made to work easily. All you need for reliable operation is some thing to stop the AAA cell rattle. Works great clipped to a belt, pants pocket or pack strap. Output on eneloops and quality alks seems to be an honest ~100-130 OTF lumens when comparing to my other lights. The UI for constant on and strobe is just like a novatac T series light. I like the layout of the UI as it is atm. One concession I would make it that it would be nice for it to be programmable in someway then we could all have it come on in a mode of our choice. Though it would have to be programmable. (IMO) I cannot stand memory function. I much prefer to know what level a light will come on in all the time without exception. On that note it is much easier with this shape of light to hold ones finger over the lens while selecting a lower output. Thanks to Selfbuilt and AardvarkSagus for their reviews!!!! Next thing is to pop in a neutral XPG, Or even one of those newer cree emitters when they become available. Last edited by Rat6P; 10-29-2010 at 04:12 AM. Anyone else out there using one of these. Great little light. I have been using it a while now and the only thing I can pick on it about is the switch needs some tweaking. Would love it it Sunwayled made a 2AA tube or extension for these. The extra length in this format would make it a lot nicer to hold, and sit more securely in tool belts/rigs/harness etc, not to mention the extra lumens. This looks like a nice design. 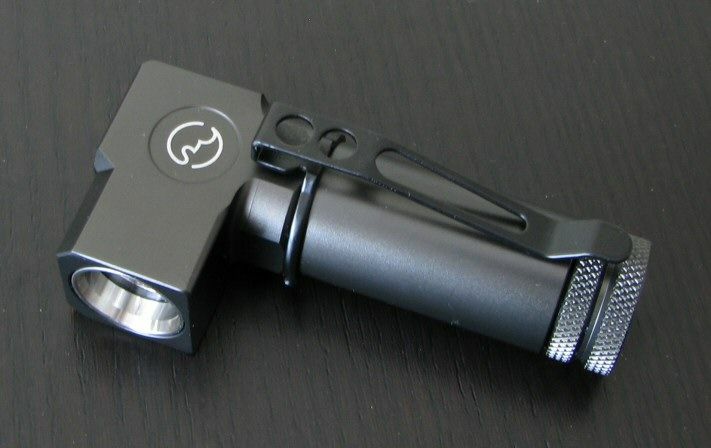 Often, while I have my current single AA EDC in my mouth for hands-free use, I think "Why don't they make a good single AA angle light?" Looks like this could be it.